I suppose I shouldn't be surprised that my new hairstyle attracted a lot of attention when I arrived at Monza for the start of the Italian Grand Prix weekend on Thursday. I had it dyed blond a few days ago in Los Angeles. It was just something I fancied doing on the spur of the moment. I am in a very experimental period of my life. I like taking risks, I like trying new things, whether it be style or restaurants or whatever. I was at the hairdresser and I just thought: "I'm going to try it, let's do it." Zero cares. It's short term. I'll keep it for this weekend and then I'll probably go back next week, and who knows, maybe I'll do something different. 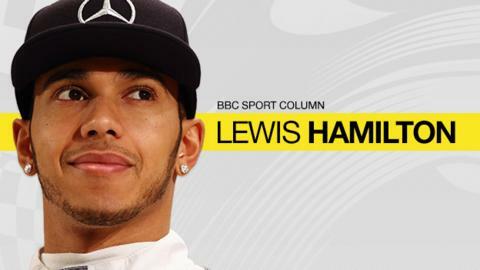 Lewis Hamilton says he changed his hairstyle "on the spur of the moment"
I went from LA, where I attended the MTV video awards, to New York and then back to Europe for this weekend's race in Italy. From time to time, I notice that I sometimes get a bit of criticism for going back to America so often, and attending some of the events I go to. Formula 1 is the sort of place where people tend to have an opinion about everything and usually they tend to believe their own opinion is the right one, even if it relates to someone else. I certainly lead a different life from many people. I have a great life that I am thankful for and I like travelling. If I don't travel, if I stay at home for a week, I would go out of my mind. That is just the way I am. I love to be on the move and I am fortunate that I have friends all over the world. There is a personal side of things to the time I spend in the States, and also a business angle. I spend time over there partly because I have projects that I am working on that require me to be at meetings and so on. Always, though, I am trying to balance to the best of my abilities my training, health, and mental and physical condition. Until this year, I cared what people thought and tried to live to people's own expectations rather than my own. But I turned 30 over the winter and I have really got to a point in my life where I am comfortable in myself and I would never make any decision if I felt it was detrimental to my performance in the car, which is the number one priority. Sometimes I would see some of the comments people made about me and wonder whether they realised what I had achieved. It's like me commenting on how someone else dresses. It doesn't matter what I think; what's important is how you feel inside. If changing my attitude on this has helped me drive better, it's subconscious; it's not something I'm aware of. But I am certainly really enjoying this year and I have really found a good balance between all aspects of my life. I feel like I have been switching between extremes before. Initially, it was too far towards the quiet side - girlfriend wants to go out, and I'd say: "No, I have to be up early to train." Then, I might occasionally have gone too far the other way, and now I have found the middle way that works for me. Hamilton wrote of his new tattoo: "My eagle represents a visionary. I'm a seeker and I'm willing to push the limits of self-discovery and personal freedom. The eagle is a born leader and may become impatient with those who cannot fly as high or as fast"
I am more at ease within my job, within my skin and with how I drive and where I stand. I have never had a doubt I was the fastest driver out there, but that belief is stronger than ever, although of course like anyone I still have doubts and worries if things don't go my way. I'm more aware than ever of my role within the team and F1. I am a world champion, there are kids who want to drive like I do, so how I carry myself, before and after a race, and how I speak will have an effect, and I take that more seriously than ever. It's the same within the team - my job is to lift them up, even when we are all down. And I am finding that more rewarding than giving myself a hard time. The season has gone well so far but there are a lot of challenges coming up. As the year comes to a climax, it becomes increasingly intense. It's easy to tighten up, and when you do that you are prone to more mistakes. So I am focusing with my engineers on how we keep getting better and better, always looking to improve. After this weekend's race in Monza, we head to Singapore, Japan, Russia, America, Mexico, Brazil and Abu Dhabi. It is going to be busy, there is a lot of travelling and there will be sacrifices to be made - I will have to weigh it all up because this is the most important part of the season. Pirelli have done a thorough investigation into the tyre failures suffered by my team-mate Nico Rosberg and Ferrari's Sebastian Vettel at the last race in Belgium. We were all concerned about the failures, but I don't believe that some of the changes proposed by Pirelli for this weekend are the right approach, even if they are doing it for understandable reasons. Increasing the tyre pressure, as they are planning to do, reduces grip and increases wear, and no-one has any experience of running the tyres at those pressures. The tyres have been great for the last couple of years and my personal view is we don't need to make that change going into the weekend. I don't think we would have any problems if we ran the tyres in the same specs here as we did in Spa.